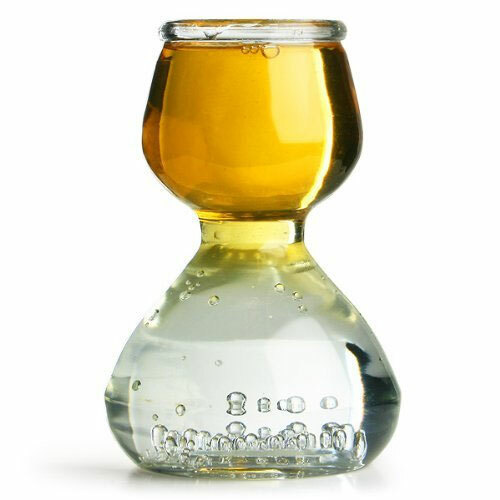 The Quaffer is a patented shot glass with a built-in chaser. It measures 2.25oz on the bottom and 1.25oz on top. You put any chaser in the bottom and any liquor on top. The liquids will stay separated until consumed. Oh, okay. Makes sense now. Good thing it’s Friday. I’d buy that! With rootbeer schnapps on top and regular beer chaser on the bottom!! Or maybe some kind of Irish car bomb.. Bailey’s and Guinness? ?